Amethyst looks over at me while she's sitting down at the drum circle, and says, "What time is it John?" My watch beeps as she's finishing her question. I say, "What time is it? It's four eleven!" It's been quite a long while since I read the book, but I thought this 1998 adaptation (featuring Leonard Nimoy) was really pretty good. One little change I found distracting though: they assigned a last name to John the Savage: Cooper. And the guy even kinda looked like John Cooper! Last weekend we attended DragonCon, a really really big sci-fi/gaming convention in Atlanta, Georgia, and we had a really great time. Since we'd never exhibited there before, we started out feeling like no one really knew who we were... but by the end of the weekend, we were surrounded by friends! 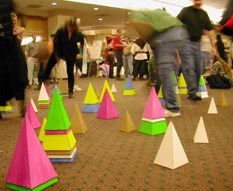 For each of 4 days, we ran a little storefront in the Exhibition Hall all day, then each night we hosted an informal game of Giant IceTowers which attracted bigger and bigger crowds. We got a new batch of really cool promo cards (delivered to our hotel at the absolute last minute) and we attracted a huge amount of attention for our little company by giving thousands of people a slice of German Cake, and/or a card explaining what the big pyramids were all about. We left with the feeling that this would become a new tradition for us. DragonCon is my new favorite sci-fi con! A couple of things that make DragonCon special are its sheer overwhelming size and the high caliber of the costumes being worn throughout by its attendees. I've been to quite a few conventions in my day, and never have I seen so many really impressive costumes being shown off at the same time. It was so big, they even held a six-block parade on Saturday morning, with police closing off the streets for it and everything. There were so very many great costumes being worn (and in many cases, just barely worn) that I couldn't even begin trying to photograph them all, and didn't even try. I left that to the crowds of other photographers (including Todd), who stalked the costumed beings, requesting photos. Of course the thing we really dig about DragonCon is its strong emphasis on gaming, and we were happy to see that the crowd really liked the pyramids, particularly the big ones. (In fact, sometimes it was hard to make people understand that the big pyramids are just an oversized novelty version of the tabletop sized product they were meant to advertise.) 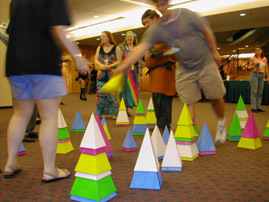 Each night we had only to show up with the pyramids, and people would begin playing IceTowers continuously with them until we put them away again late at night. Folks just couldn't get enough of it! Above we see Carol Townsend, a blur of activity as she explains the game to onlookers, and below are a couple of views of our booth, with Alison at the cash register and Kristin teaching Aquarius at the demo table. Alison began the first public playtesting of a new Icehouse game she's currently calling Crystal Gluttony... here you see it being played with both small pieces and large. Since real-time games have that sports-like quality when played with giant pieces, she's intending that this game be played without turns, and these first tests of the mechanic were quite promising. But these photos are just here to tantalize and intrigue you... Alison won't be ready to put up the rules until it's undergone further playtesting locally. Kristin had a grand time passing out the DragonCon promo card, a new Chrononauts Artifact called German Cake. 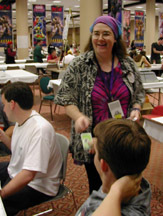 She spent a lot of time just wandering the convention, approaching little groups of gamers or aliens or whoever they were, and offering them a slice of cake. As always, while our official staff was just us 3, we got a lot of help from fans and friends without whom the weekend would have been a lot more difficult. Thanks again to everyone, especially Russell, Carol, Nikki, Meg, our own toK and Todd, Pam (a total stranger who helped us sort promo cards), Russell's friend John, and of course Cynthia, who kept teaching new recruits how to play IceTowers long after the rest of us were all worn out. Thanks so very much! We'll see ya'll next year! A Note Regarding Chrononauts: Since announcing that a few minor changes and corrections are being made for the second printing of Chrononauts, we've gotten several queries as to the availability of an upgrade kit of some sort. Unfortunately, we have no plans to do this, as it would be outrageously expensive and hardly justifiable. Most of the changes are entirely cosmetic, so you'll just need to mark or memorize the changes to 1962, for which we've changed the "and" to an "or" and vice versa. Or, you can just play it as printed... we've been doing that for 2 years now and having plenty of fun, despite our decision to tweak it. Whatever you decide, just make sure all players know how you are handling the Cuban Missile Crisis before you begin. Sorry, no cartoon this week... I've already used up all the bandwidth (both creative and digital) for this page with photos from Dragon-Con. But as a consolation, here's one more: that beautiful blond hair belonged to a girl whose badge identified her as "Random Hottie". Visiting DragonCon is rather like visiting an intergalactic spaceport, where all fictional universes intersect. Everywhere you look you see Storm-Troopers and Klingons and aliens of every sort, all milling about in a luxurious futuristic city.